One of my girlfriends gave birth to a beautiful baby girl a couple of weeks ago and I haven't been able to see her yet. Our boys are going to a birthday party together tomorrow so I wanted to have a gift ready for her. When her daughter was born the standard email was sent out regarding date, size, and a bunch of absolutely stunning photos. I decided to take those photos and put together a 6x6 scrapbook for her. I will admit that I have yet to buy the new Simpy Scrappin' Milestones kit, but I did have half of one of my retired sets left over. What I did realize when I went to package it up was that I only have baby boys gift bags in my closet... that's what happens when you have two little boys back to back:) I decided to take the same idea from the little Halloween bag from yesterday and make a coordinating gift bag for the scrapbook. I really had fun using the new Big Shot Two Tags die to make the little gift tag as well. I also loved having an excuse to use up some of beautiful wide Pink Pirouette ribbon! I've got another sample of the scrapbook coming up next week... can't wait to share! I don't know about you, but every time that I enter a store, whether it be the local craft store, the grocery store, or even the hardware store, I always seem to go away with something that I intend to use for a project later. I am proud to say not only did I enter a store on Thursday in search of some fleece blankets and come out with crafting supplies, but I also used them the following day! These little kraft gift bags were absolutely perfect for decorating! We were away at our rec property when I came across the Pals Paper Challenge for this week. Although I do have a great deal of duplicates of my tools etc. so that I don't have to cart them back and forth, I have NO stamps there! Each time I go I take along a few stamp sets for projects that I know that I need to get started on as well as a few that I just want to play with. This time I had brought along From the Crypt (115460). I will admit that I have recently become a ribbon ADDICT! Any project seems to be naked without it! I got to break into my new Cast-a-spell DSP too! I thought that I would share some of my fabulous convention swaps with you over the next few weeks. I've got them in my little clear card stand as the majority of them are only card fronts. The talent at Convention was a little overwhelming. 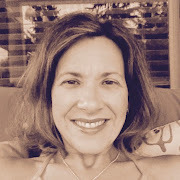 I have a hard time going up to someone I blog stalk (hmm, hmm, Patty Bennett:) and asking them to swap. I did however make a point of doing that this time around. By the way, I'll share Patty's card tomorrow:) These two cards were definitely stood out for me. It's funny how the pirates got me this year! Probably has something to do with the 4 and 5 year old boys I live with! And seriously... can that monkey be any cuter! Last Three Days for Recruit Promo with a Bonus! 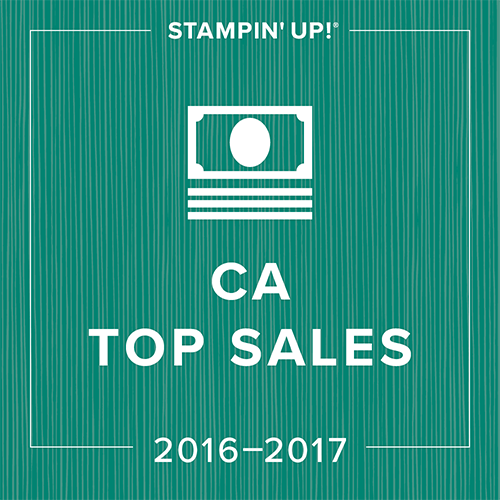 We are into the final 3 days of Stampin' Up's recruiting Promotion and this is one you don't want to miss out on! If you have been around Stampin' Up for awhile then this mini Starter Kit for just $105 is an AMAZING chance to join. 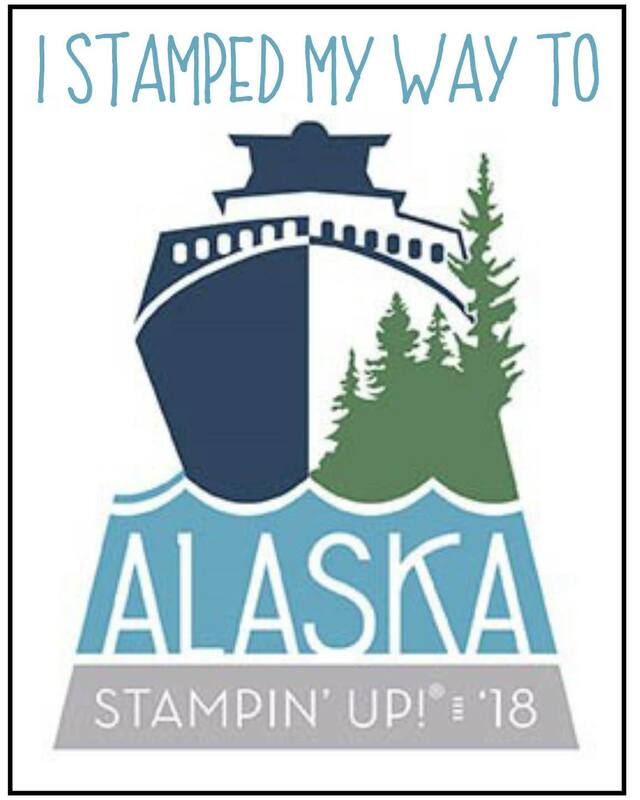 If you're new to Stampin' Up then this is a great chance to join and get that discount you're always wished you had at the same time you get your stamping supplies well stocked! We never know what life will throw us, and when I joined a year and half ago it was "just for the discount". Not in my wildest dreams did I imagine that I would be going on a Southern Caribbean cruise, one of the top new demos in Canada or heading off on a 5 day pampering trip to Utah! The regular starter kit is not discounted at the regular price of $269 but... Stampin' Up has thrown in one of each of the new In Colour stamp pads as well as a package of the cardstock. This has a value of over $50! To join now, click on my Shop Now link on the right sidebar. This will take you to my SU site. Click on Join Me in the top right corner and then just follow the instructions. My password when you go to join is scrapaholic. I can't wait to have you as part of my amazing team of crafters! If at least 2 new recruits sign up with me between now and 10pm August 31st then anyone who joined my team during this promotion will be entered in a draw for $100 SU shopping spree from me! Talk to your friends... now's the time! I was working on a card for technique club the other day and had already decided that we would be using the watercolour pencils on the BABW bears. When this Stamping 411 sketch was emailed to me I thought that it was simple for "KISS"ing (Keep It Simple Stupid). I grabbed the new BABW DSP and then got to work. The best part was on my two club nights that nobody made the same card. My ladies either stamped the girl bear or the boy bear and then chose their Build-a- Bear Workshop DSP. I was just standing by to cut/ grab the correct ink/ find some coordinating ribbon. I love it when we all start with the same base and then everyone jsut takes off from there! I know that it's hard to tell from the photo, but I used my texturz plates on the Ballet Blue background. The only problem I was having was finding a punch long enough for my sentiment. In the end I just punched the word window punch twice while overlapping it to get the longer version of the word window. Then I stamped my sentiment on a peice of whisper white cardstock and just stuck it down on the cardfront under the Ballet Blue layer. If prayers alone could sell my parents house it would have been sold months ago! They are in the process of trying to move from Winnipeg back to Vancouver but the market in Winnipeg has just not worked in their favour. The have THE MOST BEAUTIFUL house I've ever seen there, but the market for more expensive homes in Winnipeg is not very large. All they want is to get back to Vancouver to their grandchildren and children. I was playing with this stamp set, Welcome Home, the other day and decided that if I was going to have to make some cards for my mom when they moved that they would have to be simple seeing as she TWO ZILLION friends! My downline Sabriena came up with this layout for me:) I used up some of my old Riding Hood Red grosgrain as I will often use retired products when working on a sample for the first time; but this card would look stunning with any of the new colours of 1-1/4" Striped grosgrain and coordinating cardstock! I do however LOVE the colour combo of Kraft and Soft Suede and this was used here! One of the things that I love most about my clubs is the contagious sense of excitement. Something that has developed over the past year is this little show-n-tell session at the start of club night. Many of my girls will bring their latest creation to share with us. This month was no exception. This was just one of the cards that was brought. This amazing friend was quite concerned that "it isn't all Stampin' Up"... never an issue! We all have our favourites that we work in along side our SU stuff. I thought this was an absolutely stunning card that she had made for her partner for their anniversary. She had used the card style that we worked on last month as her base and then she just went from there. I don't know how many of you remember the Rustic Rooster hostess set from the last catty, but if you look on the far left and far right panels, that was how she created the script background! Thanks for sharing ladies... keep them coming! I'm so sorry about the photo quality here... apparently my brain stopped working and I forgot to check the photo quality before my ladies left lastnight:) We had club lastnight and I threw in a quick little 3-D project. 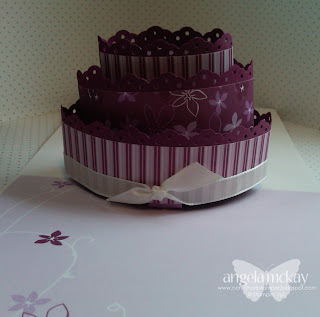 This was done using the new Flower Folds Die. We used the two smallest sized flowers. After pushing the new jumbo grommets through the smallest flower, we used our punch and put in the rhinestone brads through both flower layers. Finally we curved up the petals of the smallest flower and worked the Mega paper clips (4") around the brad. The are very secure, but not permanent so that they can be changed out when you get bored. I bet that you're wondering exactly how many projects that we did while at Convention... well let's just say I've got a few days more. These were done using the Treat Boxes on page 159 of the catty. You get five in a package for $5.25 and they take only second to assemble. The looking stunning by themselves, but by adding a tag and the new Real Red Polka Dot Grosgrain they were absolutely adorable. Looking at this photo just reminds me how stuck in the box I am as it would never cross my mind to stamp my sentiment twice like this and just punch out a portion to put over the original! (Anybody out there worried about me teaching Grade Seven yet? :) I think one of the coolest things that I found out about this product that had also never crossed my mind was that it is the perfect size to fit A2 notecards and envelopes. 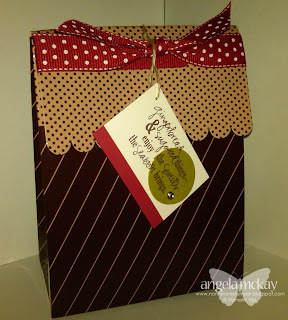 I can't think of any cuter packaging to take to a friends house as a hostess gift during the holidays! I couldn't resist taking out my Blackberry and snapping a pic of these fabulous t-shirts at Convention! I immediately emailed them to my hubby:) You can only imagine his amusement as he was sitting at home taking care of our two little monkeys! Have a great day Dawn! Seriously... Can It Be Any Cuter? If you haven't already received your Holiday Mini in the mail, start watching for it! Stampin' Up has offered some brand new products in it and they are all SO CUTE! 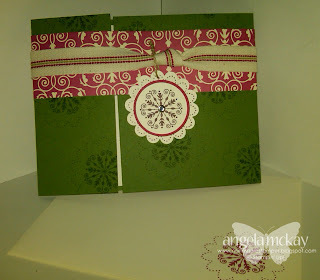 This is a CASE of a card in the mini using the new Sweet Treat cups and Sweet Centers stamp set ($41.95)! As demonstrators we are usually offered a pre-order from the new catalogue items. On top of that SU often offers us some kind of deal on the items in the new catties and this one was no exception. 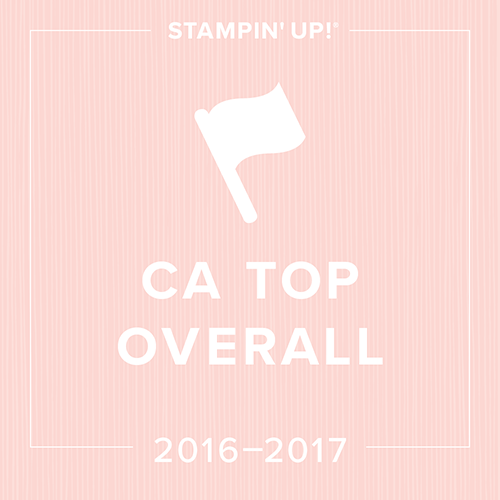 We were able to order the Sweet Centers stamp set for only $7 with the minimum purchase of some other stamp sets from the catty. By joining my West Coast Creators team right now and taking advantage of SU's fabulous recruiting promotion (click on the link on my right sidebar), you would still have access to this preorder special until August 31st! This particular card is a thank you card for one of my fabulous hostesses in September! Notice that the little Sweet Cup is filled with the new Playground buttons! Just wait until you see the Mom and Me Class that I have for October! Host a workshop totaling $330 or more and choose any one item* from the 2009 Holiday Mini Catalogue for only $14! Host a workshop of at least $525 and get My Digital Studio for 50 percent off the retail price (retail price: $106.95; promotional price: $53.47)! Call me to book a private Stamp-a-Stack for you and your friends! I absolutely love this new hostess set! Can those snowmen get any more adorable????? While away on vacation I was limited to which stamp sets I could use as I only had the ones that arrived in my Holiday Mini Preorder. Had my little brother not been able to grab my order you would have only been seeing Trendy Trees samples as that is the only stamp set that I managed to forget at our rec property the last time I was up. Much as I love that stamp set, I was going to be hard pressed to use it with the new Christmas Cocoa DSP. Hey, now that I think of it... I could have made some cool Christmas cards using those trees! 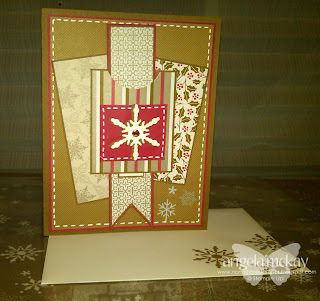 This will be one of the cards that we will be making in my Christmas Stamp-a-Stack on September 28th! When my plane arrived from Salt Lake City, at the Vancouver airport on Sunday, my hubby was already packed with the kids and dogs in the car to take our family away on a vacation. I had no problem with the fact that I wasn't even going to get a chance to go home until I found out that my Holiday Mini pre-order wasn't going to arrive in time for Sean to bring it along. The order was expected to be delivered on Monday:( So when I found out that my brother's arrival was being delayed by a day to our family vacation I wasn't at all disappointed considering he lives a block away from my house:) I must have called him 25 times to ensure that he would get my message to go and grab the boxes from my front door. I decided to pull out some of my new stuff and play using the Mojo Monday Sketch Challenge. When I first looked at this sketch all I could think was, "what in the world am I supposed to do with that?" But when I looked at the new Christmas Cocoa DSP I started to see a card coming to life. I made a bit of a "boo-b00" as I was doing the faux stitching in bottom right hand side of the card so I used a couple of the new Merry & Bright rub-ons to cover it up:) I decided to make a little adaptation in that I used DSP instead of a ribbon in the center of the card, and if you slide up the little ribbon the sentiment comes out to read, "Make Merry". I used the new Merry Details Sizzlit to do the snowflakes in Whisper White and Soft Suede. I love the shadow effect you can get by putting the darker colour just slightly offset from the lighter. I finished it off with one of my Circle Fire Rhinestone brads. 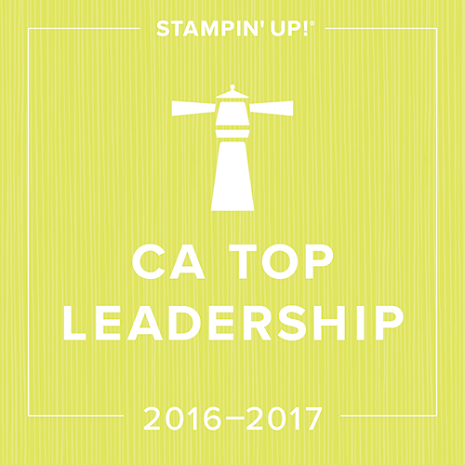 A few weeks ago, I earned a new title with Stampin' Up. As I've promoted higher in the company, my new titles have come with some fabulous perks. This particular promotion earned me a $200 product bonus! I decided right away to spend it on something that I would not have made a priority before. I have two little boys, so although I found the Build-a-Bear products to be adorable, I wasn't really seeing a lot of use for them. I decided to order ALL of the BABW (Build a Bear Workshop) products! I was sadly mistaken in my assumption that my boys would not be interested. Between them and my niece and nephew, I have not even got to touch the die cuts. They love making the bears and dressing them. This particular card was one that I did for my boys to give to their grandpa for his birthday yesterday. It started off being just a practice go with the stamp and then as the bear became cuter and cuter I decided to utilize for a card front. By clicking on the image you'll see that I used the balloon stamp as well as my Colour Spritzer to do my card front. I know that it's difficult to tell from the photo, but his little had is actually stamped and coloured separately and then popped up on dimensionals. I can't wait to do a children's birthday party now using these products! Just wait until I show you the card that my niece made for grandpa with the die cut bear! Here is yet another lovely sample from Convention! This was done using the Bigz Two Tags Die. I was so thrilled when I completed this make-n-take as I learnt something new about the die. I had bought this die purely based on the longer tag. I loved the shape of it, but I still wasn't sure what exactly I was going to do with it. I never realized that the scallop circle punch fit so perfectly into the end section of it. Nor did I realize that the other tag, the adorable one that folds in half, was going to end up being my favourite! I think that this is one of the things that has definitely made me appreciate being a demonstrator more and more. Not only have I had the opportunity to go to Convention etc. and learn about the new products, but on a very regular basis, Stampin' Up releases tutorials to their demos as well as class samples that make me view products in a whole new light. The stamp set used in this particular make-n-take was Sweet Season from page 29 of the new catty. Here's another one of the cards that we did at the make-n-take session at Convention. I absolutely love this stamp set and I was dying to get it. It definitely would have been in my first order after the catty came out, but as I knew that I would be receiving it at Convention I decided to exercise some patience. 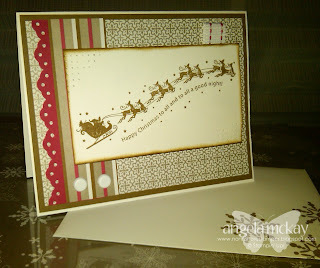 I loved the simplicity of this Christmas card that Stampin' Up designed for us to make. The only change that I made was to change up the ribbon for one of the new ones from the Holiday Mini being released on September 1st. I must admit that it was awfully fun to come home from that amazing Convention to multiple boxes of new stamping supplies. Especially after seeing many of them demonstrated on the Main Stage. While we're at Convention we get an awesome Make-n-Take session using products from the new catty! The give us the most fabulous ideas... the only problem is that the wish list that we all seem to have grows exponentially! 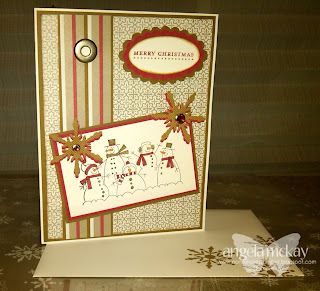 This particular card was done using the Hello Again stamp set from pg 114 of the catty. I will admit that these new In Colours are REALLY growing on me, particularly the Crushed Curry, Rich Razzleberry and Soft Suede! If they're growing on you too check out how you can get them for free by clicking on the Recruiting Promotion in the right side bar! Okay, this post could be a little confusing so make sure to follow closely. This is a bit of those stories that starts with, "my aunt's, cousin's, dog's friend:). This was a photo that we had taken while at Convention of the Colourful Impressions group that I am part of. Kristina Koch, who is in the far right of the back row, is the leader of our group; I am in her third level downline! Major talent here! She was 6th top demonstrator in Canada this year! Now that I've got you oohing and aahing... check this out, in the front row on the far right is my direct upline Kari Metzger... she was the 7th top demonstrator in Canada this year and the third place Rising Star last year! The best part of the whole process is that by joining my little group you get to part of the West Coast Creators, my group, Sea to Sky Stampers, Kari's group, Created by Design, Ann's group, and Colourful Impressions, Kristina's group. I hope that you all noticed Shelli standing in the middle of all of us! It may as well be Brad Pitt as far as I'm concerned... she is absolutely AMAZING and so real it makes your head spin. If being part of this fabulous team is something that interests you at all, whether for the discount, the business opportunity of the just the friendships, then make sure to contact me and don't forget to check out the fabulous promotion in my right side bar! From August 12th-16th, any people who sign up as part of my West Coast Creators group will receive the stamp set of their choice from the current catty! 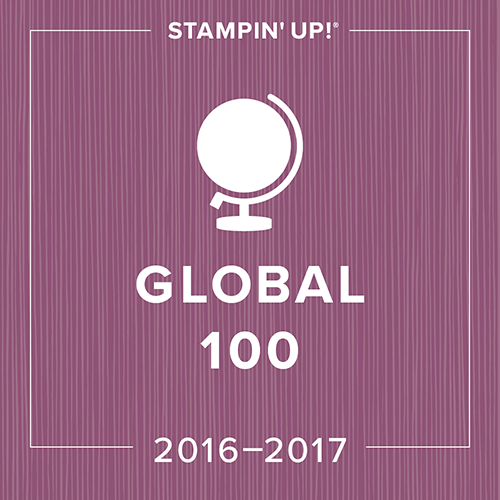 This is in addition to the fabulous extras that Stampin' Up is offering you! While at Convention, Stampin' Up has what is called "Memento Mall". It contains a variety of items that we would not normally be able to purchase. This year, with the introduction of Build-a-Bear in the new Holiday Mini, we were able to purchase one of these Special Edition Stampin' Up Build-a-Bears. Check out the bottom of her foot and the adorable apron! The Build-a-Bear products were far more impressive in person than I ever imagined! I can't wait for mine to arrive. You'll be able to check them out when your Holiday Mini arrives this month! Here's some photos of the beautiful necklace that I received lastnight as well as the adorable backpack that we got for Founder's Circle. The inside of the bag coordinates with my new favourite DSP, Cottage Wall! I thought that I'd share with you some of the goodies that I get to take home from Convention! Four of the stamp sets and the wheel were in my Convention bag when I picked it up and the other four stamp sets I received from the awards table for a variety of things from downline promotions to my sales this year. Yes... it is as good as it sounds! Well, tonight was the big awards ceremony and although I knew that I had won the Rising Star Award for Canada, I wasn't sure of what place I'd come in until tonight. I will admit that I burst into tears when I heard the words," and the number one Rising Star from North Vancouver is..." the rest was a blur! That's me in the teal coloured dress standing next to Shelli! Sorry about the blurry photo:) This was definitely the highlight of Convention! I received a beautiful necklace from Tiffany's as well as a $2000 cash award... talk about spoiled! The other two women with me are so talented and I felt so honoured to be up there with them. First of all let me start off by saying that Convention is absolutely CRAZY and I now understand why people love coming so much. It is much more than I ever imagined and today made it absolutely AMAZING! This picture is of me at the awards booth today. I received a message when I did my online check-in last week that let me know that I had won an award and that I needed to report to the awards booth. I received 6 new stamp sets on top of the ones that I got in my Convention bag. Then I received the best news ever... I was going to Founder's Circle. For those of you saying "huh?" I'll give you a brief explanation. 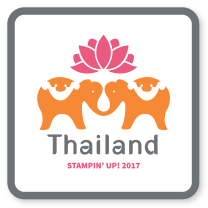 Every year Stampin' Up sends about 130 demonstrators from across North America to Utah for a 5 day retreat. As a Canadian there are very few opportunities to earn this reward as we only make up about 10% of the demonstrators in North America. We only make up 22 of the roughly 130 demonstrators. I am in that group! We found out at the Awards Booth only when they brought out our Founder's Circle Convention bag which we go in addition to the already adorable convention bag (yes Sabriena, it's too cute! :) Everybody in the area screams when the Founder's Circle Bags come out of the back and makes a huge deal. It was so much fun and my upline Kari, who is also attending Founder's Circle snapped this pic as I was receving my bag. Tomorrow night is that actual awards ceremony and that is where I will find out what place I came in for the Rising Star Award in Canada as they award this to the top three demos in Canada for their first complete year. Can't wait to share more with you! I've got some fabulous swaps to show you over the next little while! Tomorrow morning is the first General Session and apparently we will be hearing some big news tomorrow! *If you can not attend these classes I will mail you them as a take home class at no additional charge! Well, I would love to brag and say that I completed all 97 of these cards on my own, but that's not the case. I was lucky enough to have had my mom and dad staying with me for the past three weeks and my mom loves a challenge! When I designed my original swap card last week I decided to share it with my mom to see what she thought. I probably should have explained to her that I planned on making a 100 before I asked for that input as the card just became more and more complicated:) I actually stopped at 97 as I ran out of supplies. I was so thrilled to be done three days before I left that we actually did 44 more of another card that I'll share with you tomorrow! August Stamp Set Giveaway is here! Here is the Monthly stamp set Giveaway for August, the Level I hostess set called Holiday Best! It has some great stamps in it for the upcoming holidays including: Thanksgiving, Halloween and Christmas as well as Valentine's Day. Every $15 you spend this month with the exception of your initial club order gets you another chance at winning! The winner of July's stamp set giveaway is Monica Szakun! Congratulations, you've won the Level I hostess set called Love Bug! I have your stamp set here ready for you!